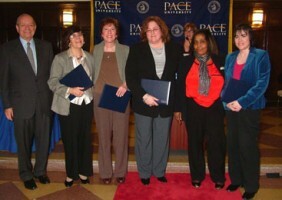 The five members of the CLOUT program’s administrative staff – Lynne Larkin, Faith Faulk, Linda Pennachio, Christina Pocchiari and Marie Iadavaia – were honored for their teamwork with the President’s Award for Excellence at the Employee Recognition Ceremonies held in White Plains on March 18. The team was recognized for its tireless efforts to preserve the CLOUT program in the face of threatened debilitating cost cuts. Since its founding in 1991, the CLOUT program has provided educational opportunities to economically disadvantaged individuals to help them acquire marketable skills as office professionals with the goal of achieving economic independence. The program, with a retention rate of 65 percent, has been remarkably successful. To-date, over 300 people have completed either a CLOUT certificate or degree program and have gone on to gainful employment. Over the years, CLOUT has had to adjust its offerings to comply with changes in welfare reform laws and changes in Westchester County’s education/training policy. The need to cut back on services provided by governmental agencies at all levels precipitated by the recent financial crisis and economic downturn nearly resulted in the demise of this vital program. Fortunately, Lynne Larkin, CLOUT director, and her dedicated staff worked tirelessly as a team to streamline their program to the satisfaction of their funding source while preserving its mission to help disadvantaged individuals find meaningful employment in an increasingly technological workplace.